Welcome to my site, here I describe the trials and tribulations of researching, building and operating a 4mm scale narrow gauge model railway exhibition layout. 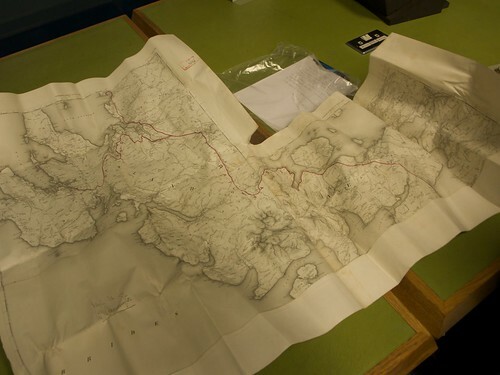 The basis for the layout is a proposed line on the Isle of Skye in Scotland, which I found the plans for in the National Archives at Kew. I have modelled the southernmost terminus, Isle Ornsay. From here the line would have covered a distance of 72 miles through Broadford, Portree and then on to Uig, with a branch from Portree to Dunvegan which I am currently working on a new model of. If you want to see where my layouts are to be exhibited, or to see how you could book it to attend your exhibition please see my exhibition diary. You can read progress on the construction of the layout on my blog, as well as railways and exhibitions I’ve visited. The other aspect of this site is to collate information on all Scottish narrow gauge railways, be they proposed or constructed. If you have any information that would be useful, please get in touch. A great layout – I’m very interested in the performance of your locos. I’m trying to decide whether to build my next Welsh layout in 4mm (doubts about slow running etc) or 7mm (lack of space); your layout is making me think 4mm is possible. The Portescap like performance of your locos – would you put that down to DCC? I’d be very grateful for your opinions. Thanks Robert. Yes, I do think DCC helps, but the chassis I’ve used so far are mainly from ready to run Austrian narrow gauge prototypes made by Bemo or Roco. They run well out of the box which is a big help. Chipping them makes the slow running much more reliable than it already is. If you’re worried about the space for 7mm then I’d go for 4mm, there are chassis out there which allow good running. It just takes a bit of cleaning and TLC to retain it. We’ve just had a superb holiday on Skye – I spent my evenings working on my 1931 SR weedkilling train, looking out across the Kyles of Raasay, wondering what the projected railways for Skye would have been like. I think your layout gives a good idea of what might have been. Have you posted any system maps or track layouts anywhere? I have only the branch from Portree to Dunvegan left to describe, which I hope to do in the next few months. I’m hoping to make another trip to Skye to take plenty of photos all along the route later this year. Peter Jarvis- what an incredible layout – any pics on the Net ? Also really inpressed with Skye HLRC at B&B exhibition – great layout ! Hi Peter, thank you. Yes, there are some on here but not in a very organised manner yet. I’m hoping to take a few to update the website with soon. Mick Thornton also has some on his page for Narrow Gauge South 2011. Thanks Ken, not to worry about the photos, if you like use the contact form on the exhibition page of my website to get in touch, I’ll let you know my email address to share photos then. I have a few more T&D wagons to build, including a Paul Titmuss card kit for a bogie brake van, and some Parkside Dundas open wagon kits. 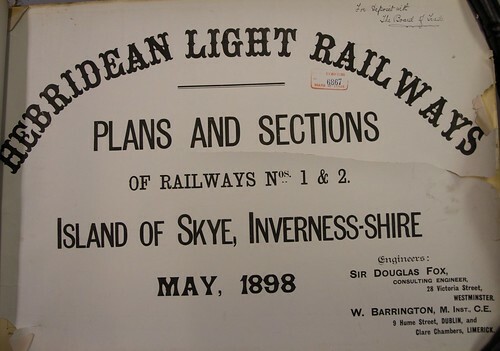 Very interested in the story of the light railway that was proposed for Skye. I am currently researching a television documentary about the hebrides and would love to know more. How can I contact you? What’s your postal address? I see from your replies on here, that you ‘chip’ roco narrow gauge. Any tips for chipping the latest roco non-dcc 0-6-0 for a beginner please? i would like to know, do i completely remove the two resisters that are in series between the pickups and the motor or do i leave them connected and cut between them and the pick-ups and leave them connected to the motor? I have the latest roco dcc starter set on order and would like to increase my fleet. Hi Pete, yes I do. I’d suggest you remove the resistor and hard wire the chip between the pick up strips and the motor. If you want I can add some photos of the loco wiring, but mine is far from neat at present – they were done in a rush and i’ve never gotten around to shortening the wires to the chip. thanks for your advice, tom – I removed the resisters and capacitor, soldered the relevant wires to the pick-up strips and the motor wires to the ‘L’ shaped motor contacts, that were then secured with a dab of superglue, to stop then turning. incidentally, when you did yours, did you notice the possible dry joint where the resistor was soldered into the rivet, but not to the pick-up strip ? I have informed Roco of this. I have also converted the little Feldbahn loco – simple – once you pluck up the courage to solder to the minute motor terminals- a lenz silver mini + was used in both cases. I now await the heljan yeo – I think that one will be the only one in L&B livery. Tom, do you recall whether there were ever plans for a railway between Garve and Ullapool?